Good morning folks! Today I'm excited to share my Girly Bits Season of Sparkle swatches with you. Made up of nine polishes, this collection is well balanced between glitter toppers, jellies, shimmers and more. I don't know about you, but I'm ready to start lookin' at some pictures! Eggnogoholic is sure to be a favorite for many of you -- I know it is for me! A soft white base with delicate gold glitters, this jelly beauty reached the opacity seen below in three coats. It had a lovely formula and I enjoyed the way it looked with my skintone. Eight Crazy Nights is a glitter topper made up of blues, silvers, diamonds and holographic pieces in a clear base. I couldn't help myself and layered this one over Illamasqua Cameo. I can't even begin to describe to you guys how much I loved these two polishes together. If you look carefully, you can see one of the blue diamonds on my middle finger near the word "NAILS" in my watermark. Fathomless. Hnnnnggggg. Look how pretty this is. I needed four coats for opacity here, but the layers weren't thick and the translucency of the base really allows the gold and green sparks to shine. I had no troubles with the formula. Don't you just want to go live inside this polish forever? 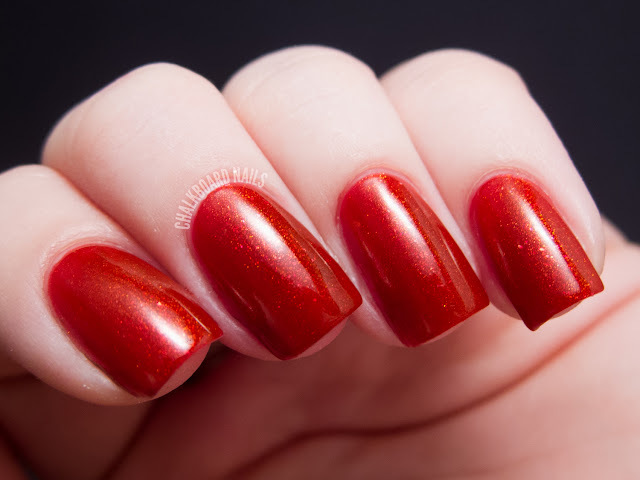 Heirloom is a clear based glitter topper "with all the vintage shades of a Victorian era Holiday." I love that description from Girly Bits. It does have a rather antiqued look to it, and I chose to layer it over OPI Berlin There Done That to try to complement that aesthetic. This is 1.5 coats. Hot Toddy is a warm and shimmery red jelly. Sure to warm you from the inside out. :) The shimmer in this is beautiful. I believe I used three coats for the swatch below. Long Winter's Nap is a cool grey base with blue, grey, and periwinkle glitters. I've shown three coats of it alone here. I am always drawn to greys, and this one is no exception. Long Winter's Nap feels so inherently "wintry" to me, I want to wrap up in a blanket when I look at it! Ornamental My Dear Watson is a multicolor glitter topper made up of fuchsias, golds, and blues. I seriously enjoy the name of this polish so much. Shown here over American Apparel Dynasty, Ornamental appears to have a bit of reflective curling in areas but does lay flat on the nail. Visions of Sugarplums is a showstopper! It starts with a warm purple jelly base and then adds loads of glitters. Most notable are the iridescent glitters that make this polish so eye catching. I've applied three coats below. 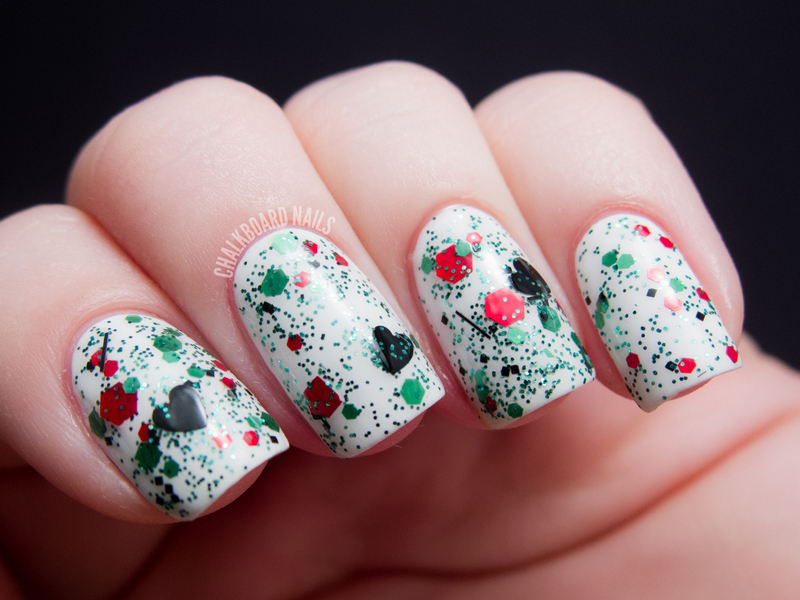 ♪You're a Mean One...♪ is an adorable take on the red and green glitter topper. It's packed with micro green glitter, chunkier red and green pieces, black hearts (to represent the Grinch's black heart!) and black bars. I've had the Grinch song stuck in my head pretty much constantly since I swatched this one. I'm dying to know -- which ones are you loving? The Girly Bits shop is open until 8pm EST tonight, but after that Pam will be closing for the holidays. Don't fret, though! Girly Bits polishes are still available through the stockists at Llarowe, Harlow & Co., Overall Beauty, and Mei Mei's Signatures. If you'd like to stay up to date with your Girly Bits news, like them on Facebook and sign up for their newsletter. You can also view additional swatches of this collection on the Girly Bits blog. All of them are insanely gorgeous!!! Well, except for Eggnogaholic. As much as I love eggnog, it just doesn't do it for me. I usually don't gravitate towards the red and green glitters, but You're a Mean One is awesomeness! The black hearts make it totally different. Want, Want, Want!!! There are some great polishes in this collection! I love the black hearts in "You're a Mean One"! and Fathomless is amazing! Heirloom looks GORGEOUS!! Antique Victorian inspired? A thousand times YES! I must. buy. now. I am a little torn on Visions of Sugarplums, however. Yes, it looks beautiful; I am just not sure it's a must-have for me. How amazing is it in person? It's pretty darn beautiful in person! I cant really choose one, all of them are beautiful. I think I love just about all of them! You're A Mean One might be my favorite. It's so pretty and unique too. All of these are amazing though. Wow, I really love Fathomless and Heirloom! Gorgeous! You are a swatching GENIUS! I wanted ones I never wanted before... eek! I love your swatch of Fathomless, I really do want to live there. Hahaha. And I'm loving Eggnogoholic, Heirloom, Hot Toddy and Long Winter's Nap too. Sarah, you pictures are stunning. Thank you! I don't think I've ever fallen in love with an entire polish collection before, usually there's a polish or two I'm not a fan of. But this Season of Sparkle seems to have done it! I especially love Eggnogoholic. Thanks for sharing!! Those are incredible! I particularly like her jelly glitters. The eggnog-inspired one is actually rather refined and elegant instead of fun and loud (though I like those kinds of glitters, too). I agree about Eggnogoholic! Like indie polish for rich women at holiday parties, haha. Dang autocorrect! :: shakes fist :: I meant "girl-y" not "girl-s". Well done, as always Sarah. Thank you so much for posting. I am so happy to hear that you enjoyed them all. Wow....these are so awesome! I am really loving Eggnogoholic, but these are all so gorgeous and unique!! Sarah, I love coming to your blog (and Pointless Cafe) for beautiful but REAL swatches and honesty about application. I daresay, I really need Hot Toddy and Fathomless so badly! I already have three of the others and they did not disappoint! Wow!!! These nail colors are all gorgeous. They all seem elegant and classy. These nail colors are perfect for any occasion. am following you now , hope you will follow back ! I love them all, specially the last one! I hate eggnog, but Eggnogoholic looks so classy and versatile. I love the blue and grey together if Long Winter's Nap. Fathomless and Visions of Sugar Plums are my other favorites. Ooooh, I need need NEED Eggnogoholic and Fathomless!